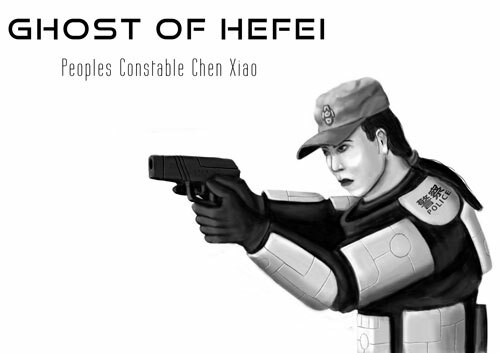 Ghosts of Hefei (GoF) features a competitive tabletop miniatures game experience where rival gangs battle to steal robot workers in a dystopic, near-future Earth. A direct sequel to Four-Color Figures' recent game, The Department, GoF focuses its lens on the action and drama transpiring on the mean streets of 2070s Hefei, China. Players take command of a gang with the purpose of stealing fabricants (fabricated human simulants) to sell on the black market. These gangs act as agents for the major global organized crime syndicates. Players use a combination of hacking, guile, and combat to compete for money and influence in the lucrative and dangerous international fabricant trade. It's a hard life in Hefei. Steal a fabricant. Get in a firefight. Try not to get caught by the police. A spiritual successor to great sci-fi skirmish games of the past, Ghosts of Hefei delivers a competitive tabletop experience distinct from, but fully compatible with, The Department.